Pharmaceutical Grade fat isomer designed to target problem body fat areas! 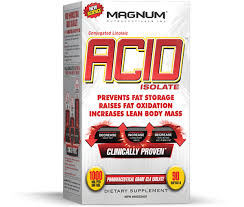 MAGNUM ACID ISOLATE is a powerful blend of the two most metabolically effective CLA isomers in the world: cis-9, trans-11 and trans-10, cis-12. Magnum Acid? helps block excess energy from entering fat cells, preventing them from maturing and increasing in size.